Back in 2013 Ofcom fined the broadband and phone provider Supatel £60,000 for mis-selling (slamming) after they were found to have switched 83 customers from one ISP to another without the individuals knowledge (here). Fast forward several years and some of those who switched away from Supanet / TimeTalk are now being hit with demands for an “unpaid” balance, which seem to range from around £90 to £800 (purely based on those gripes we’ve received). Many of those being targeted won’t have any paperwork left from such a long time ago but deny that they owe the ISP anything. All of them say this is the first time they’ve heard of an outstanding bill. Digging deeper, at least some of the outstanding balances appear to be attributed to allegedly unclosed accounts or the use of a supanet.com email address. In other cases we’ve seen people being charged £69 for non-return of an old router, which many will have long since thrown away. 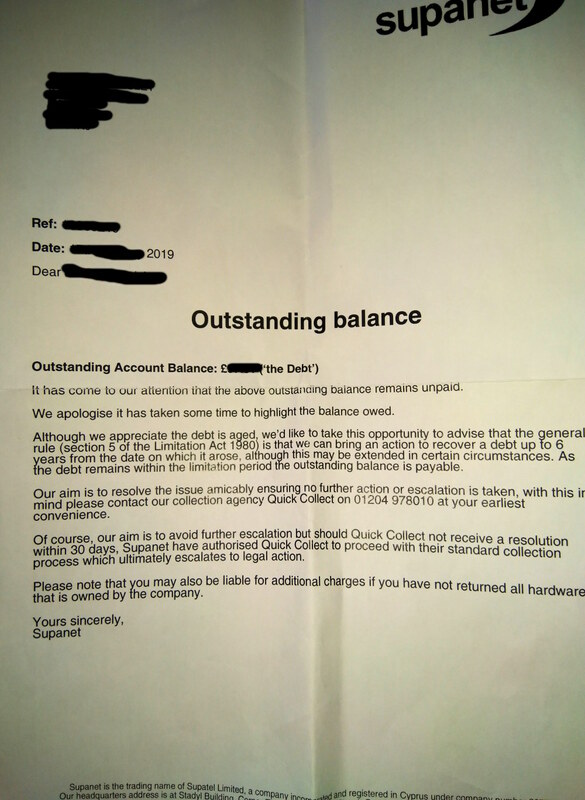 At this point we note that the letter (see our copy at the bottom) directs its recipients to contact their “collection agency” – Quick Collect – within 30 days on 01204 978010 or it warns that the matter “ultimately escalates to legal action“. However they fail to provide a postal contact for Quick Collect (it’s wise to keep related correspondences in writing for legal reasons – not giving an address is unusual for such a letter). Meanwhile Supanet itself is listed as a dormant company (here) and another company called Biometrix appears to exist at the same address (here); the latter was once called Supatel. Time Group (here) and Time Holdings (here) also share the address and some directors. Ordinarily in this sort of situation we’d be advising customers to pay and then dispute the charge afterwards through an Alternative Dispute Resolution (details below) handler or the courts, but in this case the approach leaves too many questions (some of those contacted initially thought it could be a scam) and a more robust challenge may thus be appropriate. Broadly speaking debt collection notices are required to adhere to the Pre-Action Protocol for Debt Claims (see here for a good summary), which was introduced in 2017 and advises on what information both sides are required to provide. Supanet’s letter appears to be missing some key details from that protocol, but we now understand from them that the letters have not yet reached the stage of a formal debt collection process. We’ll also highlight the Citizens Advice guidance on debt collection harassment, in case it ever becomes relevant (here). Plus the National Debt Helpline has some sample complaint letters. At this point the usual approach applies. 1) Find out where the debt has come from by asking the agency to send you a detailed summary that fully explains the charge, 2) Request a copy of your original agreement and, 3) Tell them that you wish to only be contacted by post (request their address and also company details to help confirm it’s not a scam). Essentially, get as much detail as possible. Furthermore it might be useful to phone Supanet directly in order to confirm the debt action (here) and at the same time we’d be inclined to drop Ofcom a complaint, if you feel it necessary (here). The regulator, which incidentally informed us that they “haven’t seen a particular trend in complaints about Supanet” (i.e. not enough people have told them about this), also has a useful page on disputing bills (here). After this you may wish to write a letter that formally disputes the charge and at the same time we’d notify them of your move to open a complaint via Supanet’s Ofcom approved ADR provider – Ombudsman Services: Communication, which can investigate the complaint on your behalf at no cost to yourself. 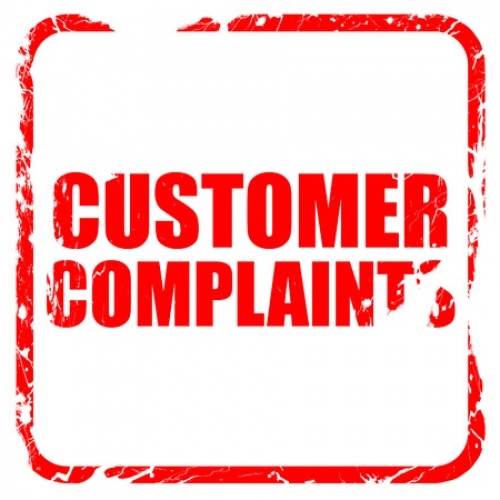 Supanet also has a document for their complaints procedure (here) and check our own Complaints Guide for extra help. Some former customers inform us that Supanet caved in after they opened an ADR complaint (probably because it’s free for the end-user but costs the ISP). However if all of the above avenues fail and you continue to feel as if Supanet’s demand is unfounded then the Small Claims Court is often an effective weapon of last resort. Such courts may take issue with how they’ve handled this, depending upon your circumstance. Strictly speaking Supanet are within their rights to chase former customers for unpaid bills, even up to 6 years after the event, although this kind of approach will undoubtedly be viewed with displeasure by many of those targeted. Similarly the fact that the ISP does not seem to have previously apprised those customers who have contacted us of any such debt may reinforce that viewpoint. Credits to some of our readers for spotting in the comments that the Quick Collect number may be linked to Internexus (company details), which previously used the Supanet name and are also linked to IX Wireless Ltd. (here). The Internexus Group seems to be in an on-going state of liquidation (expected to be dissolved on 5th May 2019). We have just received the following statement from Supanet. “Supanet as a business have located a large number of historical accounts with outstanding balances which we are currently addressing. We appreciate the circumstances may not be of an ideal nature towards our historical customer base but as a business we are acting within statute barred regulations and our company terms & conditions. Quick Collect are a trading entity of Dox2you Ltd, they have no affiliation with Quick Collect Ltd who as you say dissolved in 2016. Quick Collect are located on the same trading estate as ourselves, amongst many other businesses, hence the ideal partnership to work closely together mediating outstanding balances. Specific chase cycles are in place enabling communication channels to be opened between Quick Collect and our historical customer base. If the chase cycle is not effective a Pre Action Protocol is issued by Supanet, should we intend to proceed with legal action, in line with required legislation. Should documentation be requested by our historical customer, the required information is provided proving validity of balances owed and each case file is addressed & analysed individually, ensuring correct advice is given. By the sounds of it the letters that have been received were part of Supanet’s “chase cycle” and thus not a formal Pre Action Protocol letter. On the note about Quick Collect being a trading entity of Dox2you Ltd, we have found two related websites Dox2You and Quickdox (a joint Twitter account also exists). Sadly neither website includes a postal address. At least we were unable to find one at the time of writing and will request this detail from Supanet. We have put a few questions to Supanet in order to get further clarification on several points. I suspect ‘statute barred’ is a phrase that’s going to crop up somewhat here, alongside ‘prove it’. Indeed if its for debt more than 6 years old its unlikely they will even be able to take anyone to court for it. In this case its actually probably best anyone concerned does not acknowledge the creditor (or the bebt collection agency) as the limitation period begins again from the date of the acknowledgement. Which will then mean they can drag you to court, which is probably what they are hoping for considering the time frame. Once a debt has reached 6 years old, even if you acknowledge it the clock doesn’t get reset. However if you acknowledge it before it is 6 years old, the clock is reset. After six years a creditor can still pursue a debt, as it still exists, but cannot take a debtor to court. I would not risk it. Typically once a debt has been acknowledged by the debtor, the limitation period begins again from the date of the acknowledgement. Whether or not that still applies after a 6 year period or changes have been made to the limitations act, or if they could still take you to court is another matter. If my debt was more than 6 years old, i would not admit anything to them. Any payment you make, offer to make or admission in any way of the debt could be seen as you knowing the debt existed even after the 6 year period. Court may not occur after that but chance are you will still be pestered by the parasites. In England, Wales and Northern Ireland, the debt remains in existence but a creditor is typically unable to initiate court proceedings to recover it. (Hence the collection agencies and the threatening letters). In Scotland the law is far more clear for debts like this, the majority of unsecured debts are statute barred after 5 years and a debt that is statute barred is ‘extinguished,’ which means that it no longer exists in law. I wonder if they have tried pulling this on any EX-Scottish customers? In their case they may actually have a case for harassment against Supanet (or whatever they or their collectors now want to call thereself). Quick collect is just supanet/timetalk/6g its not a collection agency. they tried harrassing me for a balance which i never owned, blocked their number then they started calling on other random numbers from as far as liverpool to top of glasgow. so far i have blocked around 30 different numbers, they eventually gave up. They are linked to Internexus Networks Limited of which they also seem to own, so i would block every number owned by Internexus. That kind of behaviour is unlawful. This strikes me as a desperate attempt to secure some cash. They are going to end up owing regulators money again with this behaviour. but yet does it really surprise you considering the past, they also try to distant “6G” and claim they are not related. both the numbers are owned by Internexus. You are right as during one of my conversations with Supanet I asked the advisor to inform QC to hold any action whilst in dispute and she said they had been told they were not allowed to do this even though she admitted they were in the same room ! So they got fined 60k for slamming. Tiny amount. If they slammed 120 customers that’s £500 per offense. They would have stood to gain almost that in revenue from each one of them each year. That’s assuming they slammed only 120. Likely far more. In this case if there are examples of them chasing for up to nearly 1k per account, how many accounts are they having a crack at? I feel sorry for people who they go after. It should not happen. They’re obviously dodgy as all hell. Can’t be reached for contact by an industry journalist. Not playing nicely with laws and customer practices. Where is the protection that UK laws and Ofcom are supposed to provide if they leave these dirty companies to act in a lawless space until enough people complain? I have had one of these letters too. Has anyone resolved the situation please? The Ombudsman won’t have acknowledged a rise in complaints because you have to wait eight weeks for a deadlock letter. When I phoned the number, for ‘Quick Collect’ it was pretty clear they were guessing. At the end they said my debt had increased from £69 to £99. (They had offered a 25% reduction during the call to £51). When I said that I had 30 days according to the letter, they said that my phone call had indicated that I had refused to pay. I received a letter today for a debt of £69.00, apparently because I had not returned the router. I did but as that as 2 years ago and I had heard nothing since I assumed that they had received it, so I no longer have proof of postage. I was with Supanet for maybe 15 years and only left them because I gave up my landline, but that was December 2016. When I rang Quick Collect to find out what the alleged debt related to, I was told that it was actually £99.00 because mine was an older model router. When I told them that I had no intention of paying them anything, they tried to intimidate me by telling me that without proof of postage they would obtain judgement against me and that it would destroy my credit rating, etc. Then they invited me to pay £50 immediately to close the matter. I told them to send me a letter detailing the alleged sum due and that I would take it from there. Will I hear from them again? Yes you will unfortunately. Don’t pay. They have to prove the debt. Don’t talk to them unless you’re recording the conversation (make sure you tell them you’re recording if you are). I getting quite a folder of letters. I’ve reported to Ofcom I urge you to do the same. There’s alot of us about. I have received a letter from supanet demanding over £700 without stating exactly what it’s for. I know for a fact I have no dealings with supanet in the last 8 years and have not used any of their services. I am sure any account I had with them I would have closed but have no records etc. I am reluctant to even respond to their letter as I have had no previous contact regarding any outstanding amounts so cannot see how this demand can be pursued. Asking for all the information they have on me and why these charges have been implemented now because I have nothing. I noticed davidj said if you are a Scottish customer they can’t come back at you after five years is this true? I have been chased for a router. Was told I owed £69 then told they made a mistake and that I owe £99. Quick collect have been emailing me (changed email address) Called my home (blocked every number) called my mobile. Spoke to the collection company once. They keep leaving messages for me but I refuse to speak to them. So they write letters and have now said they’re contacting Timetalks legal department. They still continue to call, Mohammed is a nasty piece of work. Timetalk need to prove the debt not me. I have told them that I do not owe and do not admit liability. It’s up to them to prove the debt. Have contacted Ofcom and would advise everyone to do so regardless. National debtline have been brilliant in helping write letters to Timetalk. I left Timetalk in 2014. I recently closed my account with them they have taken £68.00 out of my account in February and March, when i phoned them they said they owed me £59.00 and they would credit my account but told me they would be chasing me for a router i did not return in 2016 at a cost of £69.00 they are bullies. When i initially tried to close my account I was harassed and they used scare tactics to try and make me stay with them. I will make an official complaint then involve ofcom. This company needs to be closed down. They are going to be dissolved in May. They are looking to get as much money from people before they shut up shop. Hoping that they’ll scare people into paying.